Next week’s T-Mobile Tuesday gifts include another piece of T-Mo-branded gear. 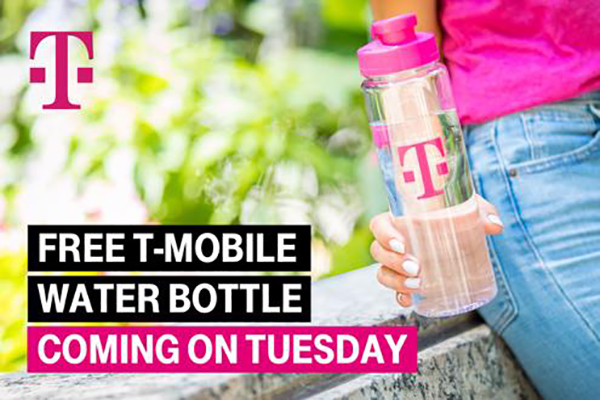 On July 24th, T-Mobile customers can get a free T-Mobile water bottle as part of T-Mobile Tuesdays. Next week’s gifts also include free FC Bayern.TV Plus for six months, 50 percent off and free shipping from women’s clothing brand Roxy, and an offer from HotelStorm. Rounding out the gifts for the July 24th edition of T-Mobile Tuesdays is $5 off any movie ticket and no fees from Atom Tickets. You can only claim this offer once in July, so if you’ve already gotten it once this month, you won’t be able to claim it again. T-Mobile Tuesdays will also have a special live trivia prize next week. If you play The Q on Tuesday at 8:30 pm ET / 5:30 pm PT, you’ll have the chance to win up to a $5,000 cash jackpot. The Q is a live trivia game show that’s available on Android and iOS. We can resell the bottles as Uber PortaPotties, we’ll be rich! And after they’re used they could be sold as lemonade or apple juice, depending on the color. I just bought a new water bottle on Amazon. Then again not sure about the pink. That’s right, that’s right. Thanks. I enjoyed the Atom movie ticket last week. The Jurassic World: Fallen Kingdom matinee only cost me $3.50.